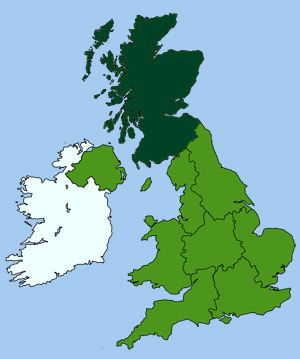 Forming the gateway between Scotland and England the southern Scottish Borders area has been the setting for many bloody conflicts through the centuries. Castle ruins and majestic abbeys can be found littered across the county, signifying the areas unruly past. During these border wars the Scottish would march against the English to the tune of the bagpipes, which boosted moral so much that it was the only musical instrument in history to be banned as a weapon of war. 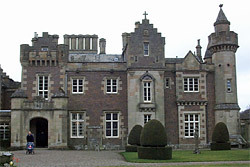 The former home of Sir Walter Scott, a Scottish nationalist, poet and novelist. His personal effects are on display in the house. Scott's most important achievement was saving the tartan, which had been outlawed to keep the unruly highlanders in place. In 1822 when George IV visited Edinburgh, Sir Walter persuaded him to wear a kilt, thereby enabling the Scottish people to wear their national dress once more. Fun child-friendly museum with a permanent exhibition on the history of Annan and a range of temporary exhibitions, local art, dinosaurs and toys. Neilson's Coffee Shop, Farm Shop, Heritage, Wildlife walks, Red Kite trail. Farm tours. Fishing, Cycling, Horses, Family games and play area. Scotland's most southerly working distillery nestles on the green banks of the River Bladnoch. The Distillery Shop offers a great selection of Bladnoch Whisky and a huge variety of Scottish gifts, glassware, jewellery and woollens. Scenic location and beautiful river walks. Gardens. Picnic area. The National Trust for Scotland. This granite boulder on Moss Rapploch marks the spot where Bruce defeated the English in 1307. It is said that Bruce rested against this stone after the battle. Eighteenth century town house in the town centre, where the renowned artist EA Hornel lived, features art gallery, studio, library, exhibition room and shop overlooking the fascinating and peaceful garden, designed with Japanese influences. Run by The National Trust for Scotland. Recently renovated tower-house in the centre of Stranraer which over the years has been used as a family house, a military garrison and a prison. Superb views from the castle's roof. Prison cell reconstruction. Family activities. Historic, beautiful landscaped gardens set between two large natural lochs with. Changing landscape through the seasons, with snowdrops, banks of spring flowers, magnificent rhododendron and magnolia displays, rare plants, a walled garden and the romantic ruined Castle Kennedy. • Charming tearoom. Champion trees. Gift shop. • Plant centre. Designed walks. Wildlife spotting. • Seasonal children's activities' Garden tours (prebooked). With its moat and battlements, Caerlaverlock Castle is the epitome of the medieval stronghold. Exhibition, shop, nature trail and more. A well-preserved six storey tower house of the McCullochs dating back to the 15th century. Its battlements command excellent views over fleet Bay. Look out for the splendid fireplaces in the great and upper halls. Well displayed local history of the village using photographs, artifacts, audio and video presentations together with activities for children. The museum is divided into several areas, each showing a part of Creetown's history. The award winning Gem Rock Museum is a unique world-class, world-wide collection of gemstones, crystals, minerals and fossils. Amazing crystal cave. It also has a quality gift shop, working silversmith and a tearoom serving home baking. Visit the home of Cream 0' Galloway. Meet the dairy cows on the farm tour. Work up an appetite in the fabulous adventure playground - great for both adults and children. Luxury ice cream. Seasonal wildlife events. Dog walks. Adventure playground. Cycle tracks, Family fun and Nature trails. Founded in 1150, in a secluded spot by the river tweed. This peaceful spot is one of the most attractive settings of all the abbeys in Scotland. Finally destroyed by border warfare, the Dryburgh is the final resting place of Sir Walter Scott and Earl Haig. Mary Queen of Scots spent her last night on Scottish soil in this Cistercian abbey founded by David I. Built in 12th century, the abbey stands in a small, secluded valley; its remoteness in keeping with the strict rules of the Cistercian order. This amazing exhibition tells the story of 30,000 people who came to the Solway to make munitions in WWI in HM Factory Gretna, called "the greatest factory on Earth!". Full of humour. As seen on BBC Coast. Experience the trenches. Anderson Shelter exhibit. Fantastic Forties' house. Robert Burns former home from 1788 to 1791. The farmhouse and steading reflect the poet's farming and literary life. Riverside walk, farming exhibits, heritage trail. Great Family day out. Founded by Roland, Earl of Galloway in 1192, the ruins of this Cistercian house occupy a site of great natural beauty. Visited by Robert the Bruce and James IV. Mary Queen of Scots stayed here during a royal progress. The wild animal conservation centre of Southern Scotland. A varied collection of over 150 animals from all over the world can be seen within the peaceful and natural settings of the woodland. Close Animal Encounters. Children's play area. Animal adoption available. Cafe. Nature trail. Gift shop. Free car park. Picnic area. One of the four great abbeys in Scotland. Built by King David I in the 12th-c. The abbey has witnessed many battles over the centuries, right up until the time of the reformation. Run by augustinian monks called black canons due to their black robes. Due to its size and grandeur the abbey became a frequent target for English troops. Experience the thrill of an underground tour of an historic lead mine, period cottages and miners' library. Discover rocks, minerals and local artifacts in the museum. Period cottages. Fully guided tours. Gold panning. Visitor centre. Cottage where John Paul Jones "The Father of the American Navy" was born in 1747. • Museum. Shop' Audio visual. Refreshments. • Many interesting exhibits. Attractive grounds. • Picnic facilities. Certified Caravan Club location. 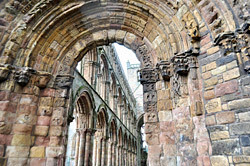 The ruins of this great abbey stand within the village of Kelso. Scott described Kelso as 'the most beautiful if not the most romantic village in Scotland'. Built at the point where the Rivers Tweed and Teviot meet. The Abbey was once the largest and richest of the border Abbeys. Founded in 1128 and destroyed during border raids. On the outskirts sits Floors Castle, a stately home of giant proportions, which is said to be the largest inhabited dwelling in Britain. Floors was used as a setting for the movie Greystoke The Legend Of Tarzan. Discover 'Scotland's most exotic garden' famed for its spectacular collection of southern hemisphere plants which flourish under the influence of the Gulf Stream - you'll find it hard to believe you're still in Scotland! • Over 1800 species. Famous tender collections. • Backdrop to 'The Wickerman'. • Plant sales, shop & cafe. • Regular family events. Digital audio guides. Laggan Outdoor Activity Centre offers first class activities for all the family. Choose from archery, mountain boarding and clay pigeon shooting or grass sledging, mountain balling and reverse steer Jeep driving. A unique tourist train link between Leadhills and Glengonnar Halt (just outside Wanlockhead). Passing through old mine workings and Largest Scheduled Ancient Monument. Transversing Britain's highest adhesion railway summit. Three miles south-east of Melrose stands the ruins of a Cistercian monastery founded in 1136, one of the greatest abbeys in Scotland. Ground floor: Geology, temporary exhibitions, history of Moffat portrayed by artifacts and video. Top floor: railway, hydro, spa, religion, farming, local trades, famous people, education, genealogy of the "Moffats" and "Johnstone" families. Built in 1577 using stone from an adjoining ruined monastery by the then Provost, Sir Thomas MacLellan, this castellated town house has fine architectural details. Fun for all the family with a large indoor play area, plus dirt buggies, boats, astroslide grass sledging. Lots of animals, tearoom serving snacks and a large Toy Shop. • Animal feeding. Climbing wall. Donkey rides. This carefully renovated, 18th century, water-powered oatmeal mill is in full working order and regular demonstrations are given for visitors in the summer. This museum has a considerable variety of fascinating items in its collections, including: nursery, tools, dairy, kitchen, smithy, textiles, local photographs, and other aspects of social history from the past 250 years in the CreeValley. The town's fine 18th-c tolbooth with displays on Sanquhar knitting, mines, miners, local literature, Sanquhar jail, archaeology and community life. Museum activity trail. Free audio visual presentation. Opened in 1892 the museum has a collection of remarkable range and quality, reflecting the human and natural history of the Stewartry. The social history collections of the 18th-c and 19th-c are particularly important. The story of Wigtownshire from earliest times, Archaeology, local history and farming plus a section on Polar pioneer Admiral Sir John Ross. Temporary exhibitions throughout the year. Traditionally associated with St Ninian. Early crosses found here are housed at Whithorn Museum, but weathered crosses carved on the walls of the cave are still visible. Award winning brewery. A small family firm where personal attention and service is assured. Traditionally brewed natural ales and award winning beers, with no concentrates, colouring or extract. Warm, friendly atmosphere. Splendid remains of a Cistercian abbey founded by Devorgilla, Lady of Galloway, in memory of her husband John Balliol. Massive tower, on an island in the River Dee, built by Archibald the Grim in the late 14th-c. Later the stronghold of the Black Douglases. Ring the bell and the custodian will come to ferry you over. Magnificent 64 acre garden for all seasons, with interest all year round. Renowned for daffodils in spring, its impressive walled garden and stunning herbaceous borders. See main rooms of Threave House and explore wider estate with trails, bird hides and wildfowl sanctuary. Visitor centre with shop and restaurant. Birthplace of the great writer, historian, and one of Britain's most influential thinkers. furnished to reflect domestic life around 1795, including a collection of portraits and belongings. Set in one of Kirkcudbright's historic buildings, the centre tells the story of the Kirkcudbright Artists Colony (1880 to present) through an audio-visual show and permanent display of paintings. Also a programme of temporary art. Follow in the footsteps of pilgrims. Discover hidden Whithorn, the place associated with Scotland's first saint, Ninian. Archaeologists have revealed evidence of churches, coins, jewellery, pottery, the famous Whithorn crosier and school of carved crosses. Internationally important site. Children's activities. Amazing panoramic views over the Wigtown Bay local Nature Reserve. Information about the LNR and the local environment combined with the "Ospreys are back in Galloway" project. Romance, scandal, intrigue. The Gretna Green Story unfolds in an exhibition and is told through audio and visual displays. Explore the shopping features, revealing a unique collection of clothing for all occasions, jewellery, gifts, whiskies and luxury hampers. Restaurant and play park.